The Skylar Jumbo Umbrella Stroller is an over-sized stroller with a lightweight frame. 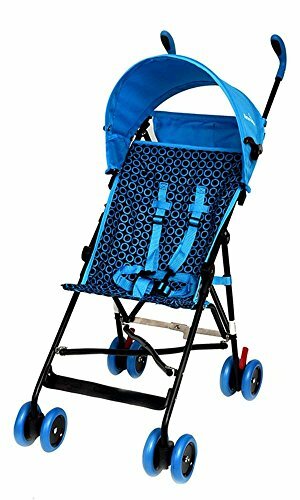 unique designThis one-position umbrella stroller has front swivel heavy duty wheels designed for children with weight up 33 Ibs.Easy to fold stroller with five-point harness, rounded movable canopy-visor, diaper and feeding bottle mesh compartments. Perfect for traveling families and everyday use.Adjustable Five-Point Safety Harness,Modern Print Seat Design with Additional Support New easy Scissor Fold Design,Rounded retractable Canopy to Protect baby Rain or Shine Swivel front wheels and slim parent handle grip,Rear Wheel Brakes and Child Footrest Accommodates child up to 50 pounds,Lightweight 8.35 pounds,Assembled Dimensions 24.5"x17.5"x37.5,"
【ESSENTIALS FOR BABY】- The Skylar Jumbo Umbrella Stroller is an over-sized stroller with a lightweight frame. 【UNIQUE DESIGN】 - unique designThis one-position umbrella stroller has front swivel heavy duty wheels designed for children with weight up 33 Ibs. 【EASY TO FOLD】- Easy to fold stroller with five-point harness, rounded movable canopy-visor, diaper and feeding bottle mesh compartments. Perfect for traveling families and everyday use. 【STABLE LOAD BEARING】Adjustable Five-Point Safety Harness,Modern Print Seat Design with Additional Support New easy Scissor Fold Design,Rounded retractable Canopy to Protect baby Rain or Shine Swivel front wheels and slim parent handle grip,Rear Wheel Brakes and Child Footrest Accommodates child up to 50 pounds,Lightweight 8.35 pounds,Assembled Dimensions 24.5"x17.5"x37.5,"
If you have any questions about this product by Wonder buggy, contact us by completing and submitting the form below. If you are looking for a specif part number, please include it with your message.